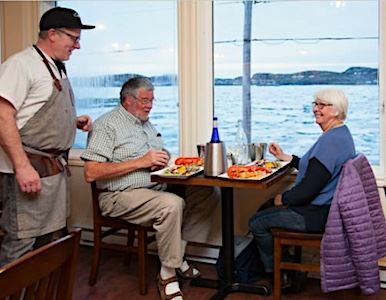 Enjoy casual dining with great views of Twillingate Harbour at Georgie's Restaurant at the Anchor Inn Hotel & Suites! Local food with a modern twist on traditional recipes and ingredients prepared by our chef and his team. Choose from a large selection of fresh seafood including cod, salmon, scallops, crab, mussels and lobster. Or in the mood for a succulent steak or vegetarian or gluten-free option? Enjoy dinner before a show, or relax and connect with friends & family. Or start your day with a hearty and wholesome breakfast from our menu. Open for breakfast and evening meals. For hours of operation and menus please visit our website. Lobster platter. Lobster is in season from May to July. Fish and Chips with tartar sauce.